I am pursuing responsible work with individuals and firms that I will enjoy and respect. I intend to use my design process to contribute to projects that address environmental and social needs. My goal is to develop simple solutions to real problems facing the planet, people and the processes that direct our lives. Exos Design is a multi-disciplinary team of sustainable design professionals. 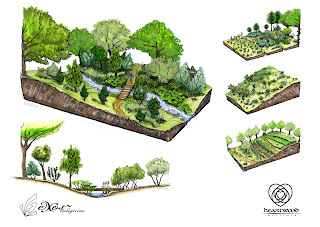 The vision is to design sustainable human habitats that balance the needs of clients and their ecosystems. As a design illustrator, it was my responsibility to visualise and express the ideas of our client. During a two day on-site charette, I was positioned as a graphic facilitator and captured the ideas and energy of a team of sustainable design professionals. These ideas were then developed into a comprehensive masterplan for the two hundred acre property. Food, energy, water and waste systems were all integrated and detailed for the future use of our client. 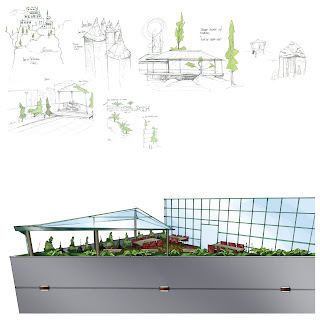 My design illustrations supplement the concept report and provide clear depictions of the potential future. Understanding our environment is necessary for limiting our impact. This design is a cutting edge integration of existing technology into a comprehensive research network. The smallest component functions as a traditional radio collar, broadcasting a signal from a tagged animal. A collection of solar powered stationary units receive and store this information. These arrays incorporate meteorological instruments, cameras, microphones, hard-drives and batteries. 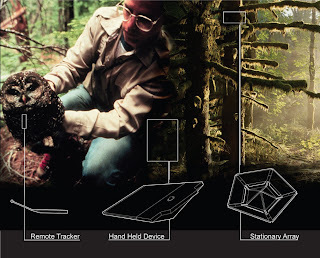 Data stored within the unit is accessed by researchers through hand-held devices. Long term ecological research is then interpreted either in the field or in the laboratory. Surveillance of this nature has potential to lead to new discoveries and a much deeper understanding of the ecological design language. Design should address the needs of the public. Holistic thinking is necessary for the development of entire systems. The concern is that most cities are ill prepared for disaster situations. 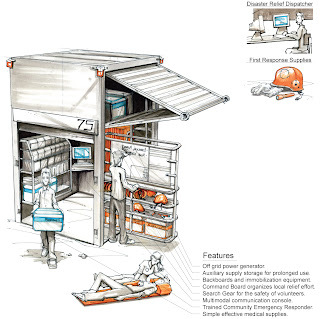 The design is a system of municipal first aid stations for use during a time of crisis. A dispatcher is connected to every station in the nation through a flexible network of landlines and satellites. In their permanent locations, each unit passively assures the public that they are self reliant and well-prepared. The contents of each Com.Stat unit are tailored to the specific needs of its location. Gloves, helmets, flashlights and medical supplies enable a well prepared public to find and treat survivors during the first crucial hours when simple solutions can save lives. Built environments contain great opportunites for improvement. This design reconsiders an existing unused work space. This is a concept for the redevelopment of an abandoned architectural feature on an already existing structure. Due to waterproofing problems and limited funding, The Ross Engineering Technology Building on the WWU campus has two large, unused roof top decks. This design solution is an appropriate integration of reused materials, rainwater treatment and student saftey all into an outdoor class room. A healthy learning environment can help occupants relax and improve student performance. Sustainable Design integrates neglected resources. 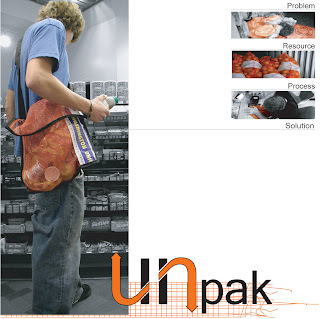 Unpak was designed and manufactured as a permanent replacement for the 9 billion grocery bags thrown away each year. Polypropylene mesh Onion bags were reinforced with scrap nylon and fitted with shoulder straps for comfort and versatility. Though Unpak may only stop the use of one grocery bag per week per user, that amount of conservation throughout an entire urban population would eliminate an enormous amount of waste. Working with limited resources and time is inevitable. Goals were set and met with practical, versatile and unique results. This project was developed for a competition. The designs had to be constructed from a 4x4 sheet of plywood in just two weeks. I applied three personal objectives to my final design; create multiple pieces of furniture, create an interactive product and utilize as much wood as possible. Boks is a slumber party for use at home, school or daycare. 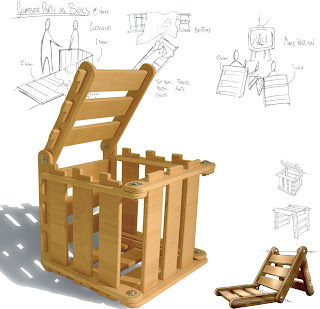 Kids can use the two interlocking futons as chairs, tables or beds. Use the imagination and Boks become a house, two forts or a train. They can be folded together to store blankets, cushions and pillows while not in use. Understanding the responsibilities of a designer is critical. This concept advocates positive solutions. 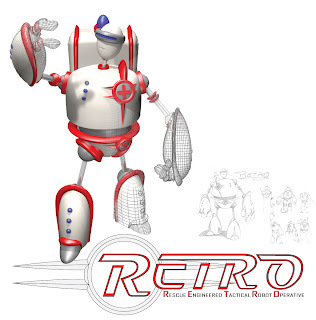 RETRO is a nonviolent robot hero. He was developed in a government funded engineering laboratory. Designed to be the first on the scene when disaster strikes, RETRO never quits. When situations are too dangerous to send in the best-trained medical personnel; He is mobile, agile and crucial. In times of crisis, RETRO is a champion on the front lines.